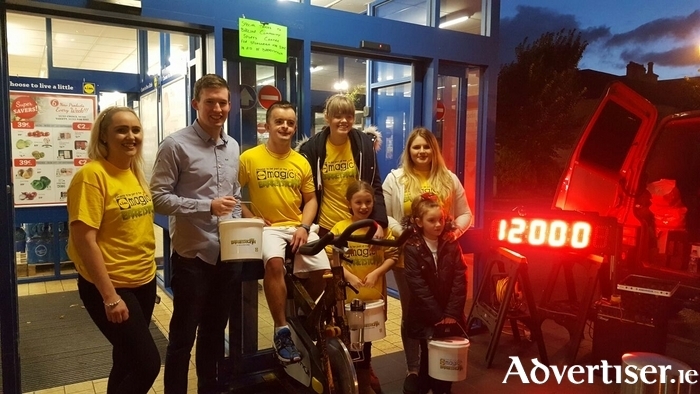 Lidil Store Manager Hugh Hester and Barrestown Buddy Lee Barrett on the 12th hour of their Barretstown Spinathon with Lidl staff at Lidl (Bury Street). A special thanks to all of their loyal customers who helped us raise a fantastic €1,400 and the Ballina Community Sports Centre for loan of the spin bike. Mayo Organic Group's October exciting meeting will take place at a new venue for them - Westport Town Hall, at 7.30pm on Thursday October 20. This will feature a brief introduction to edible Irish seaweeds, by knowledgeable Mulranny resident, Cheryl Cobern Browne. Cobern Browne is also an artist, a seaweed forager, and guide, and runs a wonderful art centre just outside Mulranny. Please note the new start time. As always, guests and new members are most welcome, so spread the word. And don't forget that, in addition to the charity raffle, there is a give-away table, members' library, and refreshments. Further information via Cleo on (085 ) 1754916 or [email protected]. This evening, Friday, The Connaught Inn, Spencer Street, Castlebar, is the venue for a fundraising table quiz in aid of Castlebar Musical and Dramatic Society [CMDS]. The society will be staging the musical South Pacific in early December. The quiz, which starts at 9pm, costs €10 per person or €40 per table. Please support this worthy cause and help keep musical theatre alive in Castlebar. The 10th edition of Kilkelly-Kilmovee Parish magazine will be launched at Ireland West Airport on Bank Holiday Sunday, October 30 at 7.30pm. MC on the night is Eunice Moran. Special guests attending the launch are Michael Commins from Midwest Radio, well known musician Matt Keane from Caherlistrane, and the very talented musicians from Kilkelly - John and Joanne Devaney, and Voice of an Angel - Cathal Gavin from Swinford. A great evening of free entertainment and surprises is guaranteed with a great door prize to be won for a lucky entrant. There will be free parking and refreshments will be served. Prizes will be presented on the night to the winning entrants to the children's art and essay competition. All are welcome. This training course developed by the National Training and Education Working Group for inclusive physical activity, sport and physical education is designed to give participants the ideas, knowledge, and confidence to adapt their sessions to make them more accessible for people with disabilities. The workshop will also examine perceptions and experiences in relation to sport and physical activity for people with disabilities, and look at disability awareness in terms of legislation, communication, and barriers to participation. The training is suitable for sports coaches and instructors, disability service staff, sport leaders, parents, volunteers, and anyone interested or involved in the provision of sport and physical activity for people with disabilities. The workshop will include both theory and practical elements. The training will take place on Thursday October 20 in Claremorris GAA club from 10am to 4pm. To book contact Ray McNamara, sports inclusion development officer, (094 ) 9047023 or email: [email protected]. Mayo Macra presents Stars in Their Eyes in Garbo's, Castlebar, on Saturday October 22 at 9pm. A night where ordinary folks imitate their idols. There will also be an Old Skool Disco with DJ Static Steve till late! Comical fun night guaranteed. Entry is €10. For more information check out the Mayo Macra Facebook page. The Order of Malta Ambulance Corps - Castlebar Unit sincerely thanks the people of Castlebar and businesses who supported the annual street collection last Saturday. Without the support of the local community it would not be able to provide its various services to the community. A public information evening about osteoporosis is being held in conjunction with the Irish Osteoporosis Society, on Tuesday October 18 in the TF Royal Hotel in Castlebar. There will be a number of expert speakers lined up including Professor Moira O'Brien (osteoporosis consultant and professor of anatomy in TCD ). The meeting will be very beneficial to the people of Castlebar and the surrounding areas. Admission on the night is free. It is that time of year again when the veil between the worlds is thin. Ballycastle ghosts have stirred and are ready to wreak mayhem and havoc once again. A spooky walk, candlelight processions, a spooky Halloween disco, arts and crafts, storytelling, and loads more will get under way in Ballycastle Community Centre at 5pm on Monday October 31. The West – Awake Honey Show will take place in the Arts Centre Ballina on Saturday, October 15. A schedule, a set of honey show rules, and online entry form have been drawn up and are available at www.mayobeekeeper.com Late entries will be accepted on the day. The president of Irish Beekeepers will also be in attendance and will give a lecture. The general public is most welcome to see the display of local honey and attend the lecture which is free of charge. Local honey will be for sale. Adapted seated exercise classes for people with arthritis and fibromyalgia are starting this month in Castlebar and Ballina. Adapted seated exercise aims to improve physical wellbeing by working on muscle strength and flexibility. This exercise class is a seated class and is suitable for people with all levels of joint mobility. The leader will work with participants in a group environment to design a workable programme based on what each person can do.Classes begin in Castlebar on Monday October 17 at 7pm and run for eight weeks in the tennis club. Ballina classes start on Thursday November 20 and run for eight weeks at the Newman Institute, Ballina, from 6.30pm to 7.30pm and from 7.30pm to 8.30pm. Call (086 ) 0657315 or email [email protected] to book your place. The Family Centre in Chapel Street, Castlebar, is holding a group meeting for those in the caring professions who may be able to improve the quality of life of people they care for through the use of social prescribing. This takes place on Monday October 17 from 2pm to 4pm. Telephone (094 ) 9025900 for any further details and booking. Mayo North East is delivering training for community groups on area profiling using CSO statistics in Ballycroy Community Centre on Monday October 17 and Monday October 24 from 7pm to 9.30pm. Participants will be required to attend both evenings. Places are limited, to make reservations contact Patricia Crawley on (087 ) 2135960 or email [email protected]. This training is free and is funded under the Social Inclusion and Community Activation Programme (SICAP ). Jobseekers and people in part-time employment can avail of a free occupational first aid training course in Swinford on October 17, 18, and 19. The training must be pre-booked by contacting Dolores McNicholas at (087 ) 7704251 or email [email protected] This training is delivered by Mayo North East and is funded under The Social Inclusion and Community Activation Programme. Knock Basilica will be closed to the public until Monday October 17 for The Story of Love concert which is taking place in the Basilica on the Saturday October 15 and Sunday October 16. Bingo continues every Monday night with excellent prizes. The parent, guardian, and toddler group has returned and takes place on Wednesday mornings from 10.30am to 12 noon. The Active Retired meet every Friday at 3pm in the Resource Centre and many play 25 every Saturday night at 9pm. A new make up course will commence on November 1 and will run for six weeks up to December 6. Anyone interested is asked to call (087 ) 1850860. If you would like a note included in Community Diary, please submit it to [email protected] by the Monday before the next publication date.